Bamboo Spa by L’OCCITANE is the second L’OCCITANE Spa in Bali, Indonesia. The Spa is located at the Jimbaran where is 15 minutes drive from Kuta or Nusa Dua resort area. The Spa immaculately and fully equipped for your ultimate relaxation with 5 single treatment rooms, 9 double treatment suites for couples, a private steam room, a relaxation lounge, reflexology area and the L’OCCITANE retail boutique. Bamboo Spa presenting: reflexology lounge, private steam, beauty salon, spa café and also L’Occitane retail boutique to pamper your body and give you a deep relaxation. 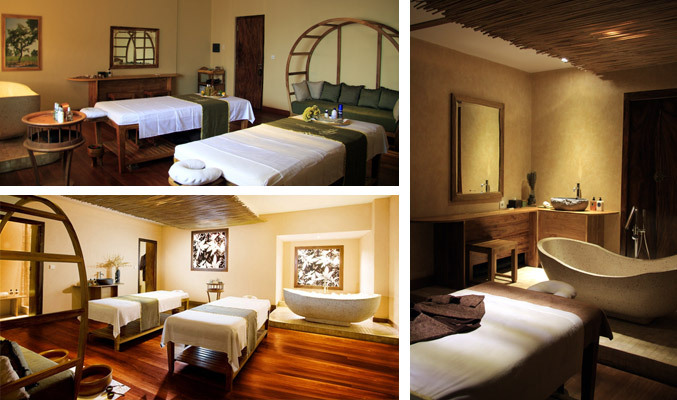 At the Bamboo Spa by L’OCCITANE, the must-try experience is our unique signature Verbena Bamboo Therapy. This unique massage promotes circulation, release deep muscular tension knots and delivers a gentle lymphatic drainage that all bring you to delightful state of relaxation and well-being. Treatments: Prior to your treatment, you are greeted with a "Welcome Ritual", a footbath performed with our Aromachologie Effervescent Sugar Cubes. Your experience then takes you on a true olfactory journey, sequenced at every step by soothing or energizing aromas. The voyage of the senses continues through gestures, sensorial textures, relaxing music and the herbal teas inspired by Provencal traditions. Every moment at the Spa L'Occitane is dedicated to skincare, wellbeing and superior service. Special attention and added treatment enhancements allow clients to experience the ultimate in naturality, with signature facials, massages, and bath indulgences enhanced by complementary treatments. Swedish effleurage, Chinese acupressure and Balinese massage technique come together to stimulate circulation, ease tensions & release stress. Aromachologie essential oils – lavender, tea tree and geranium – ensure complete relaxation. The body and mind feel truly calm: sleep can come more easily. The exclusive massage specially designed for the moms-to-be delivers enhanced relaxation and well-being. Based on the gentle effleurage movements of Swedish and Balinese techniques, more specifically applied on the back and legs, the massage releases tensions & eases tight muscles. The delightful massage is associated with a nourishing formula, enriched in grape and apricot seed oils to gently accompany the changes linked to maternity. As a result, moms-to-be will leave this cocoon of well-being deeply relaxed, calm & regenerated. This exclusive massage features all of our signature techniques to best target individual needs: Relaxing light strokes and deep tissue pressures focused especially on the back area release stress and muscular tension, while revitalizing strokes and hot stones combat tiredness, enhance toxin elimination and boost energy. The nourishing, repairing and protecting properties of Shea butter make this massage a moment of pure escape with extraordinary benefits for your skin. Skin is left soft and deeply nourished. The whole body feels replenished!